Lorenz manufactures diverter valves for vacuum and dilute phase conveying systems. Lorenz manufactures diverter valves for vacuum and dilute phase conveying systems. Two-way, 3-way, and 4-way diverters are available in sizes from 2 to 8 in., in a variety of configurations. A lightweight aluminum-sealed housing and polished stainless steel blade provide durability and corrosion resistance, as well as positive sealing. 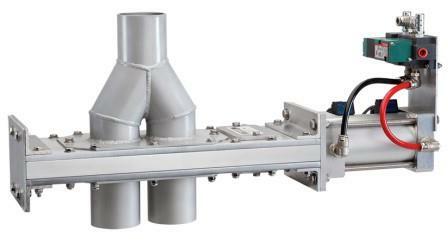 Unobstructed flow improves system performance and product degradation. Choices of inlet and outlet materials and coupling connections enhance the flexibility of the valve. A double-acting, internal magnetic, cushioned air cylinder and choice of solenoids allow custom configurations. Industry compatible sizing make replacement of current valves quick and easy. Component parts are stocked ready for assembly and shipping. All valves are fully tested and ready to install. Standard delivery is two weeks.